Hadar is a Jewish/Zionist themed avant-garde solo musical project by Na'amah Bat-Sarah combining Ambient, Neoclassical, Experimental/Post-Industrial, Neofolk, and Acoustic/Electronic styles. Tel: 708-824-7769 (not on Shabbat). Web: hadar.co.nr. Hip Hop Hoodíos is an allstar Latino-Jewish rap project based in Brooklyn that features members of major Latin- alternative groups including Caifanes/La Barranca, Orixa, and Los Mocosos. Many of the members come from mixed Latino-Jewish backgrounds, with heritage from Puerto Rico, Mexico, and Uruguay. 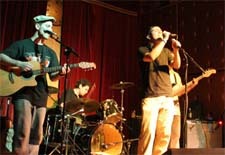 The band's multiethnic background is reflected in the music, which includes a merengue hiphop version of "Hava Nagila" reworked as "Havana Nagilah", as well as a reggae/punk version of the sephardic Hanukkah song "Ocho Kandelikas". The band's first release (Jan., 2002) was the "Raza Hoodia" EP. Band website: www.Hoodios.com. Booking agent: Zamo!. (Josue Noriega). The spectacular Hollywood Klezmer performs traditional klezmer with a unique fusion of Middle Eastern, Sephardic, jazz and classical sounds. Each musician in the group is a star performer in his own right, plucked from the top Hollywood recording studios and international concert circuit. With its roots in Eastern European Jewish culture, this World Music group entertains, educates and uplifts audiences with its joyful celebration music. Based in Los Angeles, California, Hollywood Klezmer is available in a variety of configurations for featured concerts and exclusive, private engagements anywhere in the world...from L.A. to Odessa! Tel: (818) 776-8084, P.O. Box 1448, Beverly Hills, CA 90213-1448. Web: www.HollywoodKlezmer.com. (Jordan Charnofsky). Jinny Marsh's Hot Kugel Klezmer Band, based in Springfield, VA, brings together the hottest musicians in the Washington area! We play a variety of Klezmer, Yiddish, Chassidic, and Israeli dance tunes as well as Classical, American standards, Broadway and good ol' Rock 'n' Roll. We offer all the popular B'nai Mitzvah kid games. Hot Kugel has a reputation for energizing your guests to get them up and out of their seats, onto the dance floor � and keeping them there. Based in Washington, D.C., Hot Kugel regularly performs for Jewish community events and has been featured at Kennedy Center's Millennium Stage, The Library of Congress and the Smithsonian Folk Life Festival, Washington, D.C. in 2001. We have also been featured at the National Folk Festival in East Lansing, Michigan, and the Lowell Folk Festival in Massachusetts. We regularly perform in Virginia, Maryland and Washington, D.C. We are available for Bar/Bat mitzvahs, weddings, parties, anniversaries, fundraisers and concerts. We also offer rousing horas, kid's games and teach folk dancing. This band will get your guests up and dancing! Jinny Marsh's Hot Kugel Klezmer Band also has a CD out called "Grandma's Recipes." Web: www.hotkugelklezmerband.com. (Jinny Marsh).